Shopping locally and getting involved in your local community has certainly been in the spotlight in recent years as environmental issues have come to the fore. The connection between going local and going green is easy to see – by connecting with the things nearby to us, we’re supporting our local environment rather than looking further afield for our needs. This means less CO2 emissions, a greener local area and a better approach to tackling the onset of climate change. This is perhaps why farmers’ markets have grown in popularity in recent years, in towns, villages and cities across the country, springing up even in the most unlikely of places. Farmers’ markets epitomise the ‘think local’ ideal, bringing locally grown and sourced produce to consumers, ensuring low food miles and less CO2 emissions. There are now around 500 farmers’ markets held regularly across the UK – so there’s likely to be one going on near you. Farmers and local producers bring food and other items directly to the consumer, cutting out the middleman. All items sold need to have been produced, grown or caught by the seller, and within a localised radius, which means you can be assured of its local origins. The great thing about farmers’ markets is that you can ask the seller about the product and be sure of an honest and accurate answer about what’s in it, or where it comes from. Farmers’ markets, by bringing local items to the local community, helps keep money circulating in the local area, which is good for other businesses and operations in the area. By making farmers’ markets a regular occurrence, the surrounding amenities flourish too, including local shops, pubs and other facilities. Not only are farmers’ markets convenient and easy to get to – they’re local, so cut out the need for consumers to use a car to travel there – they are also good value for money for customers. Because farmers’ and local producers are able to cut out the middleman (shops and supermarkets and other suppliers) they are able to give you a better deal and still make a healthy profit themselves. Plus, there’s always the opportunity for some bartering over the market stalls to help you secure a bargain! Farmers’ markets are taking place all the time, so look out for notices in your local newspaper to see what’s going on, as well as posters and notices in town centres. 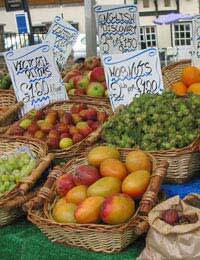 There are also several websites which allow you to search for your nearest farmers’ market, including the BBC website.